Tjahjono, H.K. 2015. Career Perception at The Republic Indonesian Police Organization Impact of Distributive Fairness, Procedural Fairness and Career Satatisfaction on Affective Commitment. International Journal Of Administration Sciences & Organization. Vol 22. No. 2. 2015. 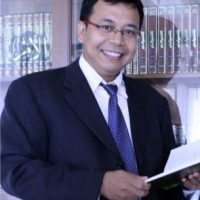 Tjahjono, H.K. 2015. Career perception at the republic indonesia police organization impact of distributive fairness, procedural fairness and career satisfaction on affective commitment, International Journal of Administrative Sciences and Organization 22(2):130-135. Tjahjono, H.K., Palupi, M., and Dirgahayu, P.
Tjahjono, H.K. 2014. The Fairness Of Organization Performance Appraisal Social Capital And The Impact Toward Affective Commitment. International Journal Of Administration Sciences & Organization. Vol 21. No. 3. 2014. A Model of Religiousity and Organizational Justice: The Impact on Commitment and Dysfunctional Behavior. The 27th International Information Management Association Conference Proceedings, 1781-1790. 2016 Pembicara International Conference on Public Organization (ICONPO VI) Thammasat University, Bangkok, Thailand. 2016 Peserta Workshop Penguatan Kurikulum Berbasis SNPT dan KKNI, Program Magister Manajemen UNISSULA.